The Radial mPress™ broadcast press box is setting the standard for press conferences and multimedia events of all sizes. This all-analog distribution system packs a ton of features into a compact 1RU rack-mountable chassis. Two high-quality mic preamps are equipped with phantom power, high pass filters, and an adjustable limiter section to avoid overloading. 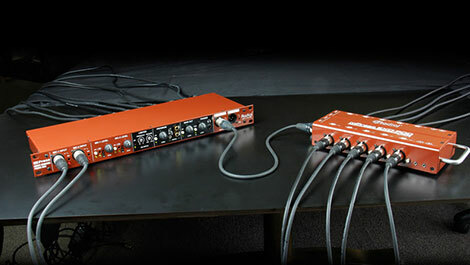 These feed eight balanced XLR outputs to distribute to the press gallery, which can be individually set to feed mic or line level recording devices. Each of these outputs is transformer isolated to eliminate buzz and hum from ground loops, and when paired with optional Exo-Pod™ modules the system can be easily expanded to suit larger events. Exo-Pods are completely passive and provide an additional ten balanced XLR outputs and four 3.5mm TRS connections. A built-in 1kHz test tone on the mPress allows for easy calibration, and a main stereo output is available to feed a pair of powered monitors for the audience. Additional 3.5mm, ¼” TRS, and RCA program inputs allow you to play background music before and after the event. For more information and images of the mPress and Exo-Pod, check out this product's Smart Sheet!